Explore Marlborough’s coastal scenery, historic towns, and wine on a full-day, small-group tour from Picton that includes hotel pickup and drop-off, transport, and wine tastings. Visit the port town of Havelock, follow Queen Charlotte Drive along Queen Charlotte Sound, then sample local bottles at four handpicked wineries. Begin with pickup at your Picton accommodations, then travel across the agricultural Wairau Plain to Havelock, where you’ll have some free time to explore the tiny center—or pause for morning tea in one of the town’s charming cafes (own expense). 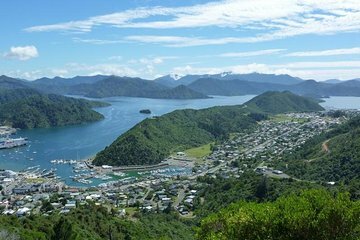 Take the scenic route back to Picton, following Queen Charlotte Drive at an easy-going pace, with plenty of stops to take in the bays, inlets, and wildlife along the sound. Upon arrival in Picton, enjoy independent time to walk around the town’s picturesque downtown, and pause for lunch (own expense). After lunch, kick off an afternoon of wine tasting: you’ll visit a carefully-curated series of four Marlborough wineries, with tastings at each location. Meet ‘cellar door’ hosts onsite for a comprehensive introduction to the wines of offer, and learn about the history, cultivation, and terroir of Marlborough’s distinctive wines. This tour concludes with return transfer to Picton and drop-off at your hotel.